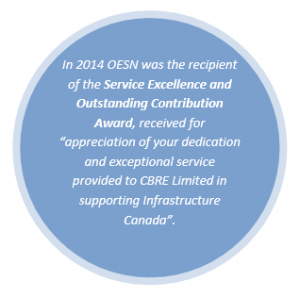 The Professional Engineers Ontario has granted OESN authorization to practice Professional Engineering in the province of Ontario (March 26, 2013, #100196570). In Ontario, professional engineers who provide engineering services directly to the public must have a Certificate of Authorization (C of A). This certificate is issued to individuals or firms and the professional engineers on the certificate require at least five years of relevant experience after the conferral of the engineering degree or the completion of an equivalent engineering education. Individuals and firms holding a C of A must adhere to the professional liability insurance regulations required by the Professional Engineers Act. ContractorCheck, a 3rd party health and safety Accreditation Program for contractors, has provided OESN with a Certificate of Accreditation, applicable for work that is performed in the province of Ontario for: Air Quality, Asbestos Abatement Supervision, Asbestos Surveying, Environmental Consulting, Noise & Vibration Testing, Occupational Health & Safety Consulting and Water Quality Testing (valid to September 13, 2017). OESN is one of eight companies in Ontario participating in the American Industrial Hygiene Association’s Industrial Hygiene Proficiency Analytical Testing Program (IHPAT) for Asbestos/Fibers by PCM analysis. The purpose of proficiency testing is to provide OESN with objective evidence of our capability to produce data that is both accurate and repeatable for Asbestos and other Fibers (in air) by PCM analysis. We have maintained a Proficient Status within the program since entering in 2014. Through the Professional Engineers Act, the Professional Engineers Ontario governs licence and certificate holders and regulates professional engineering in Ontario to serve and protect the public. The American Board of Industrial Hygiene® (ABIH®) administers the Certified Industrial Hygienist® (CIH®) credential, which is a means to objectively assess and measure the professional knowledge and understanding of practitioners engaged in industrial hygiene. The CIH® is obtained by individuals meeting educational, experience practice and other eligibility requirements, who then pass the Comprehensive Practice examination. The CIH® must meet ongoing requirements in the certification maintenance program and adhere to the professional, enforceable Code of Ethics. Radon Measurement Professionals are certified through the Canadian-National Radon Proficiency Program (C-NRPP), which is recognized by Health Canada. These professionals have been trained to a recognized standard of practice and are held accountable for working to established guidelines. OESN’s Environmental Professional specializes in Environmental Protection (focus on Air Quality). ECO Canada offers certification and professional development resources for Canada’s environmental professionals. EP Certification is awarded to professionals who meet the national standards for education, work experience, and environmental competencies. The Niagara Construction Association is a non-profit organization established to represent the interests of the commercial and industrial construction industry. Members are General and Trade Contractors, Manufacturers, Suppliers, Architects, Engineers and other professionals affiliated with the industry. The Canadian Society of Safety Engineering is a national, professional organization for health and safety practitioners that work to shape the safety profession in Canada through connecting members, innovating through Professional Development and being a resource for research and information. The American Industrial Hygiene Association is a non-profit organization devoted to achieving and maintaining the highest professional standards for its members. More than half of the nearly 10 000 members are certified industrial hygienists, and many hold other professional designations. AIHA administers comprehensive education programs that keep occupational and environmental health and safety professionals current in the field of industrial hygiene. The American Conference of Governmental Industrial Hygienists is a member-based association that advances occupational and environmental health. Members are professionals who spend greater than 50% of their employment in the field of Occupational and Environmental Health and Safety. The Occupational Hygiene Association of Ontario represents occupational hygienists and other people interested in health and safety. Through OHAO, members communicate with each other on a regular basis to increase awareness and learning.